"Inlay on Oranges with Gold Glitter," from All that Glitters. Site specific installation, 'The Party's over Soap Factory, MN. 2015. 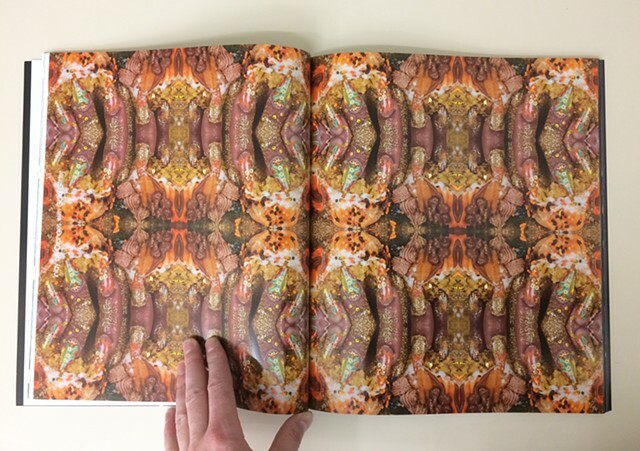 Photography based wallpaper made from staged images of Glynnus Alexander's hands and nail art. "Ombre Inlay" form All that Glitters, is a site specific installation for, "Aesthetic Theory, Girls Club, Ft. Lauderdale. May 2015. Photography based wallpaper made from staged images of Tyffanni Bickhem hands and nail art. Documentation, August 2015. Table Top vinyl illustration by Helen Maurene Cooper, Interactive nail painting performance with Sarah Beth Woods. 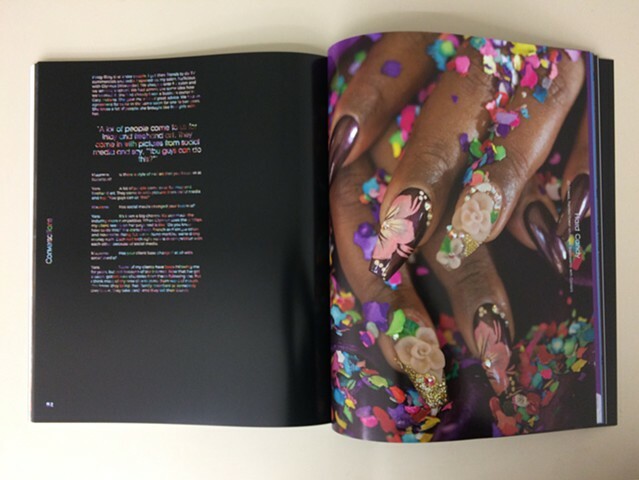 Paint & Polish sources visual inspiration from the microeconomic culture of Hispanic and African-American nail artists in the Northwest Side of Chicago. It fosters engagement with these artists by highlighting their work and collaborating with them. 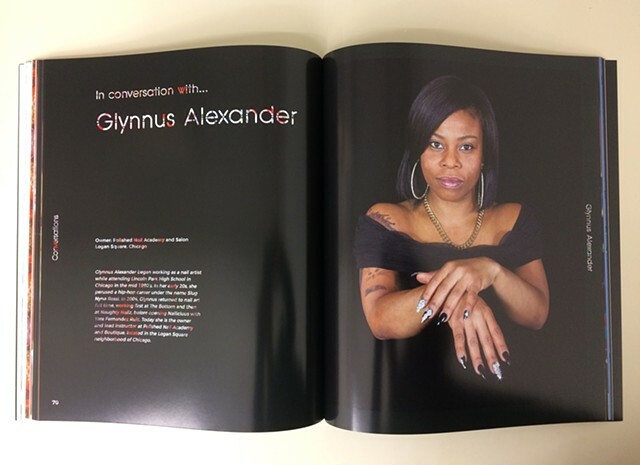 Included are oral histories, conversations with various nail artists, their portraits by Helen Maurene Cooper, and photography from their business. 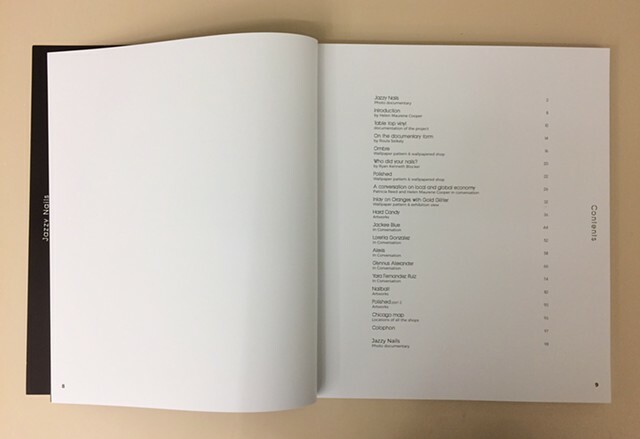 By documenting the community, this set of materials engages with it profoundly. 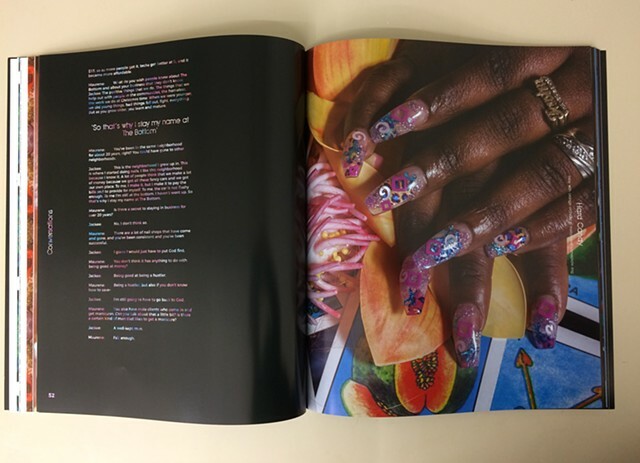 Inspired by these sources and the visually tempting, distinct style of the nail art, Cooper’s photographic artworks open a gateway to elaborate on the visual identification of nail art. 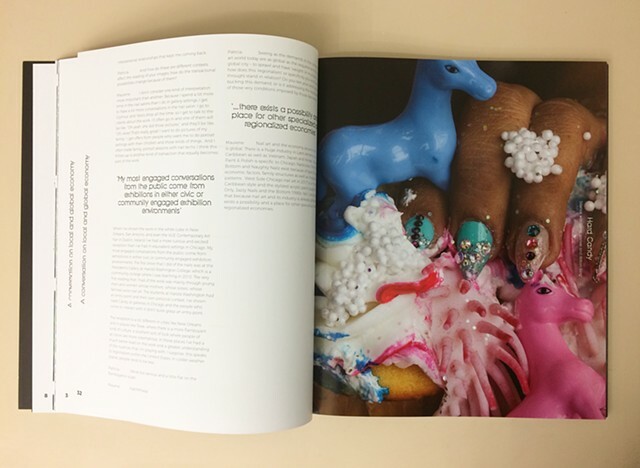 In both photography and the nail art scene, concerns such as gesture, self-expression and labor are prominent. The accompanying writings take these issues into consideration. The community of nail artists in the Northwest Side of Chicago releases a vibrant visual and cultural gesture. Sparked by distinction and thriving on its own terms, this economy shares joy equally between client and producer. 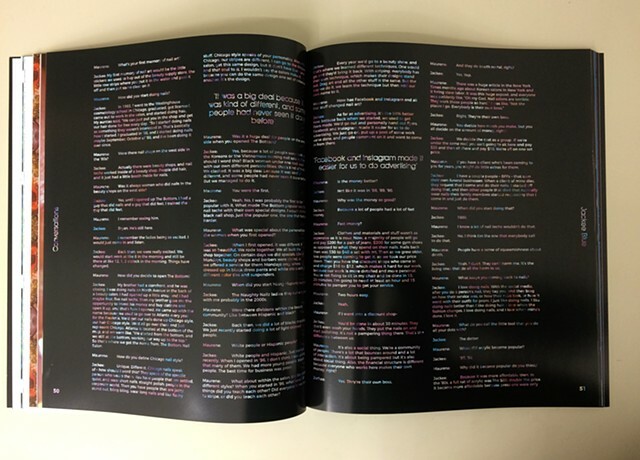 By wearing its visual code, an individual becomes part of this economic base. The nail artist community even inspires celebrities to share in the pleasures of its culture. Engaging us playfully in an outburst of visual sparks, shop owners Jackie Blue, Loretta Gonzalez, Alexis, Yara Fernandez and Glynnus Alexander make up the core group of Northwest Side shop owners who practice Chicago-style nail art. The community of salons comprises mothers and daughters, connected by both birth and mentorship, who have found long-term financial stability through craftsmanship and entrepreneurship. An East Coast native who moved to Illinois to earn her MFA degree at the School of the Art Institute of Chicago, Helen Maurene Cooper has lived and worked in the city’s Northwest Side for nearly a decade. 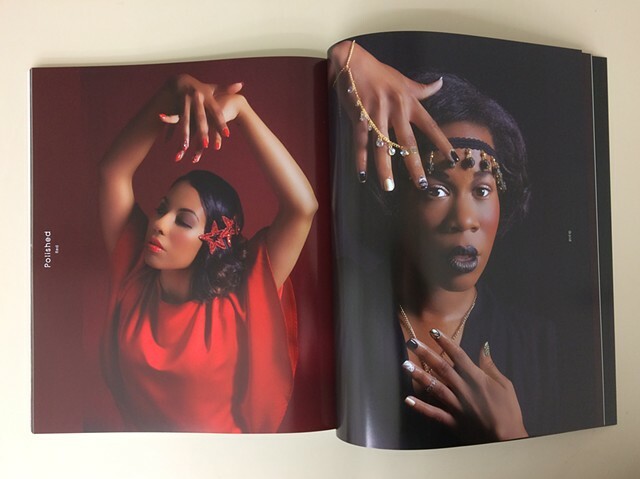 She has experienced the thrill of adornment and empowerment in its nail salons and has continued to collaborate with nail artists and salon owners for over eight years. 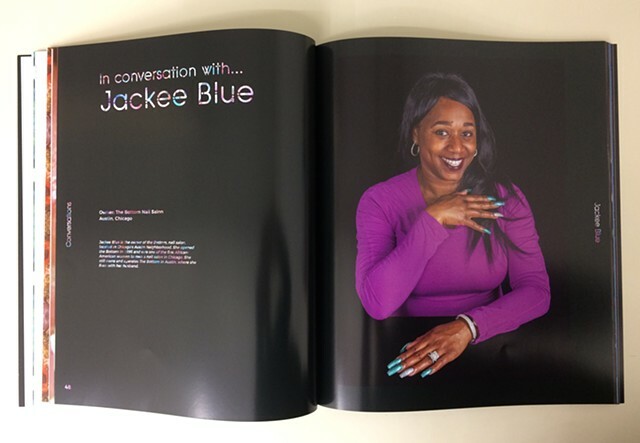 The documentary projects featured in this book are the fruit of her personal engagement with the women who own and work in nail salons in her neighborhood. Cooper’s respect for the community shines through her work. She portrays the active social cohesion and mutual cooperation among nail salon community members and identifies the visual distinctiveness of this culture. 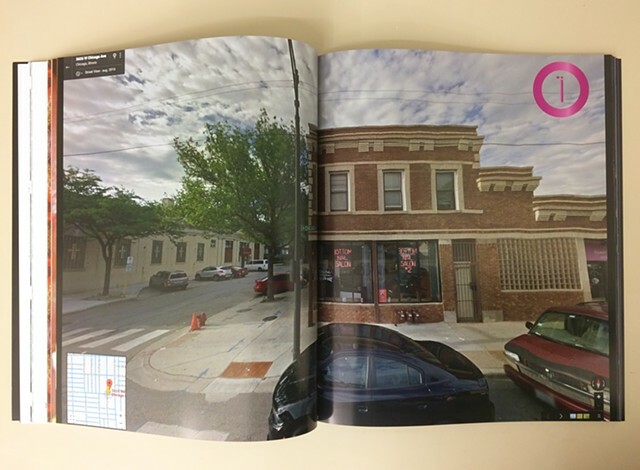 In addition to this book’s visual pleasures, it tells the story of how a community positions itself socioeconomically, while acquainting the viewer with the visual gestures it practices. Friday 16:00 - 22:00, Saturday 27th and Sunday 28th, 12:00 to 18:00. Exhibition continues until June 18th.